From a viewer's perspective, Starcraft has come a long way over the years. HD streams, quickly available VoD's, and more content than most can handle. However, there's one aspect of the viewer experience that was perfected long ago in the days of Brood War, and nobody else has come close since. What do I mean by outside the game during the game? While the game's going on, showing something on camera outside of the game. This can be broken down into two things: the players that are playing, and the audience/team bench (if it's a team league). 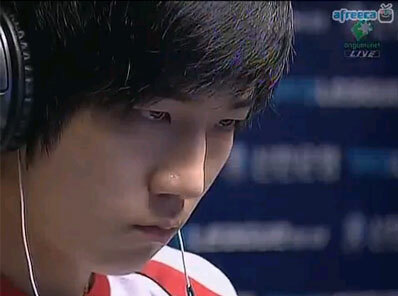 You want to watch players mine minerals, or do you want to be murdered by Jaedong's stare? People talk about faceless Koreans, players are boring, no personality, blah blah. When all you see are translated interviews in which players are asked the same thing 40 times a year, you don't get to see much from them. This is one of the reasons why it's so important for the viewer experience to actually see the players. The camera stays on Flash here for 20 seconds before switching over to Bisu. That's a pretty long time to go outside of the game. But, now you get to see the emotions and character of a player. It becomes more of a story. This is SO much better and more important than staying inside the game and seeing Flash rebuild his barracks inside his base and then mine some minerals for 20 seconds. A frustrated Zero after his army gets crushed, followed by some classic Jangbi. Again, there's not a whole lot to see in the game at that moment. Zero's just lost his army and his base is getting wrecked. The game is essentially over; it's just a matter of when Zero GG's. But, MBC decides to go to the players, and in doing so, captures magic on camera. I doubt many people remember the actual game itself. But, I'm pretty sure that almost everyone who watched that game remembers Jangbi smirking at the camera while playing. Yes, the camera zoom into the player's face. Is it cheesy? Of course. Is it also amazing? Hell yes. After a player loses all his units, what's better than the camera speed zooming into his panicked face? The examples of this could go on and on. The drama and stakes tend to be higher when you can see thousands of people cheering on the players. Or 120,000. Unless it's downtime during MLG, you really don't get to see the crowd much these days. Really, all we seem to get anymore are the obligatory "Look, a bunch of people are here" shots. Why though? Things can be so much more exciting and dramatic if this is handled properly. Literally every single person who's ever watched Brood War remembers this moment. A great game and a great strategy from July, but the reason why EVERYBODY remembers this is because of the camera cutting to Bisu's mouth dropping open. It just makes an amazing moment that much better to watch. This time, there's nothing particularly unique about the crowd. It only shows it for a second. It's just people cheering. But, that one second of seeing people go crazy just adds so much dramatic impact to the game. I don't want to make this too long, so I'll stop with the examples, but I hope that these show just how important it is to put a concentrated effort into showing the amazing and memorable things that are happening outside the game, and that in the future, more and more production teams will start working on these areas. There could be so many things happening at every big event that go unnoticed simply because the productions aren't trying to notice them. The bonus videos i think were the best. I do like the fact that they do switch to the crowd and it does make the game a lot more exciting and a better production for a tournament. The camera zoom is the greatest part of any OGN broadcast. For the longest time that was the only way I could tell who was winning a TvT. It's extremely easy to say "more tournaments should do this", without even delving into the logistics of making it happen. Those amazing camera zooms or crowd shots didn't happen by coincidence. For most productions, you'd probably have one cameraman on each player constantly, making those shots every time the player makes a face. With broadcast delay, the live production crew has a chance to see an amazing shot, and then cut away right after the action to show it. That's why every cutaway is noteworthy. Same with the shots to the crowd. OGN isn't showing the crowd because they "noticed" the crowd cheering. They've (more than likely) got a camera covering the live audience constantly, and will pan to them when there's a lull in the action...something they'll know about because of the aforementioned broadcast delay and live production crew. While this obviously isn't exactly what OGN does with its productions, it's the general process for many live broadcasts that can afford to do it. And unfortunately, that's what it'll come down to - how much money these organizations can put into each event. I'm talking about the big tournaments which all have the capabilities to do all of these things. GSL, Dreamhack, MLG, etc, all have the equipment already set up in place. They just don't use it in the ways mentioned. Interesting blog and I totally agreed with your point of view on the camera issue. Lately I tend to tune away from tournaments because it gets boring to watch and the examples that you have given are just perfect, imo. It's like the production take away the aspect of "2 people" actually playing vs. each other at some point. Would love if they would start doing more of which the example shows, if X loses an X unit or gets spotted out, ofc anyone watching wanna see how the person IRL reacts so a good blog which leads to deliberation of how we produce E-Sports to day. Also a good question mark on how we could improve the production which really has developed in the something great, i guess we could all agree on that. Lot of truth in this. At IPL5 I noticed they were doing a little bit of this (I was there live), and I thought it was funny that a guy a few seats over got all frustrated yelling "show the game!" We really don't need to be looking at the game the entire time. Show us the players, show us the crowd, even the casters if the time is right. It breaks the monotony of the production. All of this is done extensively in popular sports and its done for very good reason. Definitely; like when a team scores a goal in hockey, it's not like they just zoom in on the puck in the net and show that for 20 seconds. They show the players celebrating, the bench, the fans, the other team, etc. It's actually telling a story. Man i agree so much! In fact i'm somewhat amazed how's everyone haven't noticed it yet. Haha thanks for linking that in the SPL thread. Amazing examples. Feels so nostalgic having seen most of them live at their time.